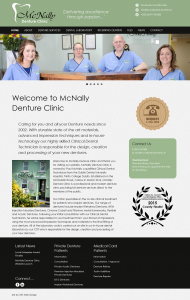 UTD Web Design has just launched the new McNally Denture Clinic Website. McNally Denture specialises in the on-site clinical treatment for patients who require dentures. They also supply fitted gum shields for professional sports players such as Sean O’Brien, Leinster and Ireland Rugby Star, currently taking part in the Rugby World Cup. The site was designed around the existing brand. To really bring out the logo we placed it on the green background used in their signage, and used the dark grey and white in the theme, with a subtle paper background texture complement it. The site has a standard layout and so should have a familiar user experience for most users on both mobile and desktop browsers. The design is responsive so resizes well to the various screen sizes it was test on. Professional images, which were supplied to us, give the site a real lift and we utilised them in the slider on the homepage and throughout the site. Some cool little features include the embedded facebook feed on the homepage of the site, which uses the look of the site rather than the standard facebook widget look and feel, which can look out of place on a site. On the location page we have a google map that shows some nice places to have coffee nearby in Carlow. There is also a handy dentist referral form on the site. The site is built using wordpress and we have installed plugins for SEO, Security, Social media, Analytics and so on, so that the site is future proofed for the client. “Thanks once again Cian at UTD Web Design. From the very start of our journey you listened and understood what we wanted to achieve and we are delighted with the result today! Looking forward to working with you in the future. Paul, Olivia & all at McNally Denture Clinic. This entry was posted in Clients, Testimonials on October 5, 2015 by Cian Foley.